Dry Needling also known as intramuscular Stimulation (IMS). is an effective technique carried out by Ann our sports massage therapist to treat pain arising from muscles and/or nerves. The treatment involves placing a needle without medication into the an area of the muscle known as a trigger point. A trigger point is an irritable hard knot within a muscle that is painful when palpated and can produce significant pain over a large area. Trigger points are quite common and can often make everyday tasks difficult. Sometimes, these trigger points may be to deep to be effectively treated by other techniques. You may now be thinking how ridiculous sticking needles into your body to relieve pain. but don’t knock it until you have tried it?. Many people that suffer from pain have found dry needling has helped to relieve the pain and in many cases has removed the pain altogether. If you suffer from any of the symptoms below you should give Dry Needling a go, as believe it or not, it works wonders. How is Dry Needling different from Acupuncture? Both methods involve inserting a needle into the tissue. 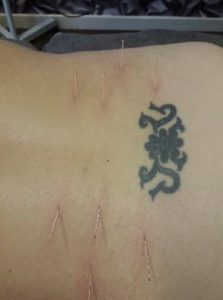 However acupuncture is different to Dry Needling as Traditional Chinese Acupuncture involves placing needles along a meridian based on Eastern Medicine principles in order to re-establish chi, or life energy, back into the body. Dry Needling on the other hand involves examination of the neuromuscular system and inserting the needles into hyper-irritable spots within the muscle in order to de-activate it, to decrease pain and restore function. Who will benefit from Dry Needling? Prior to treatment, your sports massage therapist will first perform a thorough assessment to determine if you may benefit from Dry Needling. If you are a good candidate, sessions will vary from 1-2 times/week. Your sports massage therapist may also incorporate other forms of therapy, such as manual therapy or exercise, as part of your treatment. The total number of treatment sessions will vary depending on a number of factors, including the cause and duration of the symptoms, your general health, and you and your practitioner’s satisfaction with the outcome. Dry needling works by advancing the needle into the trigger point, which causes the muscle to grab onto the needle in an attempt to repel the needle. This is called a localised twitch response. This localised twitch response is necessary in order to deactivate the trigger point and relax the muscle. This can result in significant pain relief, decrease muscle tension, increase the range of motion, and promote a return to activity. What can I expect to feel with Dry Needling? Many people may not feel the needle insert into the skin. However, once a localise twitch response is elicited, the discomfort can vary drastically. Many people describe the feeling as a muscle cramp once a localised twitch response is elicited. People will soon learn to recognise and even welcome the sensation, as deactivating the trigger point reduce decrease pain, restore muscle length and improve function. I love this place, everything you want or need under 1 roof! All staff are highly professional, knowledgeable, super friendly & the natural homemade products are out of this world & best of all you get all of this at a very affordable price. ..brilliant, what more can i say?! Had a facial today at the Hub never had one before im certainly going back for another . Could of stopped there all day such lovely and friendly people. Looking forward to returning already. The best deep tissue massage I have ever had! (and i have had many). It was so good I booked two more sessions. Amy certainly knows how to work those tight muscles til they loosen up. Very professional and friendly. I will certainly be trying some of the other treatments too. I bought some honey before I left today and it is absolutely delicious. Guess I’ve found a honey supplier too. Give them a try, you won’t be disappointed.